Flooding in Fremont County. The picture was taken on a March 18 aerial flight. In Iowa’s southwestern-most county Fremont, people from the city of Thurman are returning home after evacuating Sunday. Percival and Bartlett are fully evacuated and half of Hamburg remains evacuated. Fremont County Emergency Management Director Mike Crecelius says floodwater in another part of the county has breached a levee from the inland side, and is now flowing back into the Missouri River. Crecelius said all of the levees in his county are damaged and likely won’t be fixed in time for the spring thaw in a few weeks. Areas upstream will thaw and the water will run down to the county. “With the breaches that have been in our levees, it isn’t going to take that much for the river to rise before it gets out all over the western one-third of my county again,” Crecelius said. 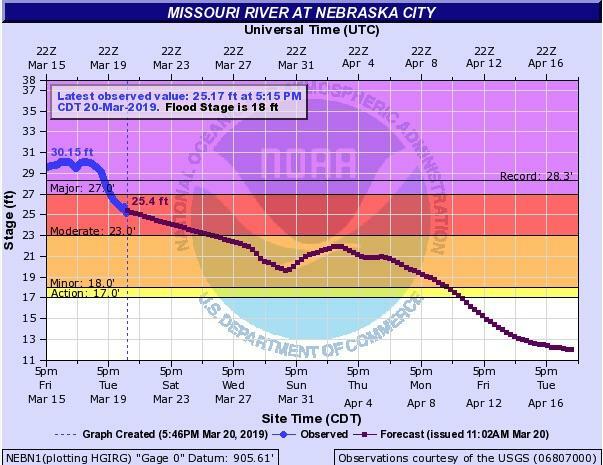 A screenshot of the National Weather Service's forecast for the Missouri River in Nebraska City. The Missouri River topped out at 30.15 feet near Fremont County on Saturday, 2 feet above the previous record from 2011. River levels were recorded at 25.17 feet on Wednesday afternoon. Crecelius visited Hamburg, and says it looked like the south end of town was under 3 feet of water. Three southwest Iowa water treatment plants were inundated by flooding as of Tuesday night, and are not producing drinking water. They include plants in Glenwood, Hamburg and a treatment plant that serves businesses, and is located along Exit 10 off I-29 near Percival. Residents in Glenwood and Hamburg are on bottled water. Finished water that has passed through other treatment plants from at least 30 miles away is being trucked to the cities' treatment plants. Keith Wilken, an environmental specialist senior with the Iowa Department of Natural Resources, said people in Glenwood can use water from the plant, but the DNR recommends they boil it first. “In Hamburg, we are recommending that they don’t even do that,” Wilken said. Wilken says they don’t know what else the trucks in Hamburg have been used for in the past, so they’re saying people there should stick to bottled water for cooking or drinking. Trucks serving the Glenwood plant are food-grade stainless steel. One of the big concerns about treatment plants during a period of flooding is the type of bacteria that could get in from the floodwaters. “Bacteria as a result of animal feces or anything that’s out there, anything that can cause human sickness or human health, that’s the bacteria we’re concerned about,” Wilken said. Surface waters can contain organisms like giardia and cryptosporidium that can cause diarrhea and other illnesses. Wilken said groundwater treatment plants are not usually designed to treat for them. Wilken said the DNR is helping the communities with non-functional treatment plants look for an alternate water source. The cities are drilling emergency wells to find water to connect to the treatment systems and keep them full instead of trucking water in.